This jaw was attached to a living Cetacean, Odontoceti of some kind. 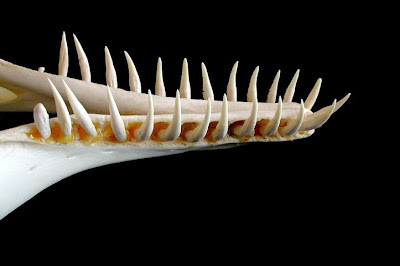 The teeth are too narrow for an Orca. Since we aren't seeing the upper jaw I'd be that's a clue too. My second guess would be one of the dolphins. The jaw is too short for a river dolphin, so one of the bottle noses. Now, now, Steve, you must pick one, you know. Yeah, I'll second Kogia. Prolly breviceps based on the tooth count. Looking forward to the follow up! On a related note, did you hear the Obamas spotted a "porpoise" in the Gulf of Mexico? Is it the year of accidental whales or what? Dolphins... There are lots of dolphins, and they differ widely among themselves. Buti don't know of any that have about this many teeth, the teeth being as long and delicate-looking as these. I see a bandwagon here, and I'm going to jump on it: I'm guessing that the jaw belongs to Kogia breviceps. gosh, if I have to pick one, then I am going with Kogia breviceps. I didn't even know there was such a species until I found that website with the pics. Another vote for pygmy sperm whale. I visited a local maritime museum last year that was restoring the skeleton of one, looks very similar. Which reminds me I need to post on that trip!